Pecans are nuts taken from a tree of the same name, a member of the hickory family. According to Food.com, they have the highest fat content among all nuts, at over 70 percent. They have golden-brown skin and pale flesh, and are available year-round in various forms — from whole pecans to pecan meal. To properly choose fresh pecans, go for shelled nuts that are clean with a plump shape and a consistent size and color throughout the batch. If you prefer the unshelled variety, look for pecans that are heavy for their size, and free from any blemishes or cracks. If a nut rattles when shaken, it may not be filled properly. Pecans should be kept in a cool, dry, place in an airtight container. Doing this, pecans can keep for up to six months. Pecans are known for being able to decrease bad LDL cholesterol while increasing good HDL cholesterol. This can help prevent stroke and coronary artery disease. Pecans are a great source of fiber, allowing them to treat constipation, as well as prevent hemorrhoids and colitis. They are effective as a weight loss aid, due to the high amounts of vitamin B-complex which help speed up the metabolism. 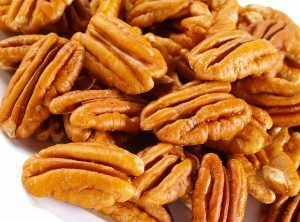 Pecans contain oleic acid, which is associated with reduced breast cancer risk. They also help prevent colon cancer by helping clear out the gastrointestinal system. Pecans are a rich in magnesium, which is known for its anti-inflammatory effects. This helps reduce inflammation in the arteries, lowering risk for arthritis, Alzheimer’s disease, and other inflammatory conditions. With their good amount of manganese, pecans strengthen the immune system. At the same time, the combination of vitamin E, vitamin A, zinc, folate, and phosphorous present in pecans improve the skin, preventing acne, and delaying the appearance of fine lines and wrinkles. Pecans can also promote hair growth and prevent hair loss. Pecans are great at adding texture and flavor to dishes both sweet and savory. They are often used in pies, tarts and cakes, but based on recipes on FoodNetwork.ca, they can also be included in salads and stuffing. Pecans are also great to eat on their own, and are an ideal snack for health-conscious eaters — as long as they are eaten in moderation. Pecans can prevent stroke and coronary heart disease. They help regulate bowel movements and prevent constipation, hemorrhoids, and colitis. Pecans speed up the metabolism and aid in weight loss. Pecans can prevent breast cancer and colon cancer. Pecans can prevent inflammatory diseases such as arthritis and Alzheimer’s. Pecans are also effective in treating acne and preventing hair loss.